Saturday, April 7, 2018 at 11:00-12:00 p.m. or 1:00 – 2:00 p.m.
Come make your own upcycled shutter herb garden, by local woodworker and cabinet maker, Art Vogt. 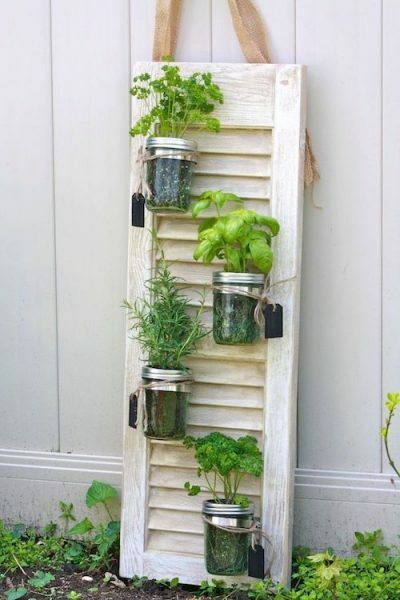 In this 1-hour class, you’ll assemble an herb garden fit for a kitchen wall, patio or garden. Limited spots available! Materials will be provided, including a reclaimed shutter, mason jars and wooden chalkboard herb labels. Herbs not included. Instructions will be provided to paint the shutter after class, if desired. Art is a local woodworker and cabinet maker. After closing his cabinet business of 20 years in 2012, Art began crafting industrial farmhouse furniture. He is passionate about building beautiful furniture using reclaimed wood. Check out his work at A Work of Art. Powered by Easterseals, Building Value is a unique store in Northside offering salvaged building materials at a great value. Proceeds benefit our workforce development program which offers valuable job training and job placement for individuals with barriers to employment. Since 2004, we’ve helped employ more than 400 individuals and salvaged 20,000+ tons of materials.